Designed to exceed your expectations, this set includes 3 elegant pillar LED candles that offer a beautiful ambient touch to your dining room, bedroom or even bathroom, without posing the common threats that a real flamed candle does. Powered by 3 AAA Batteries each, (NOT included) these LED pillar candles can live up to 50,000 hours, making them a way more economical solution than real candles that last up to a couple of hours before melting away. Don't Squander It - Order Yours Today! ENERGY SAVING, POWERFUL LEDS: These impressive candles require 2 AA batteries per candle, that are expected to last for about 150 hours, while the lifetime of the led lamps is up to 50,000 hours. Unlike real candles, these flameless pillar candles are made to last; you buy them once, you have them forever! HASSLE FREE OPERATION: For easy operation from the comfort of your sofa or bed, you will also receive one remote control with range 16.4ft that operates all candles. This 10-key remote control allows you to set timer on your pillar flameless candles per 2H, 4H, 6H, or 8H, while you can even time them to automatically turn on or off. With this super convenient remote you can enjoy the relaxation of your candles without worries! SAFETY COMES FIRST: With amazing flameless candle set you can have perfect ambient evenings with peace of mind; no worries about fire hazards, smoke, messy dripping wax or stained tablecloth. These kid-friendly white flameless candles are a great choice for any family with children or pets who want to make sure that their little ones will stay safe and sound. 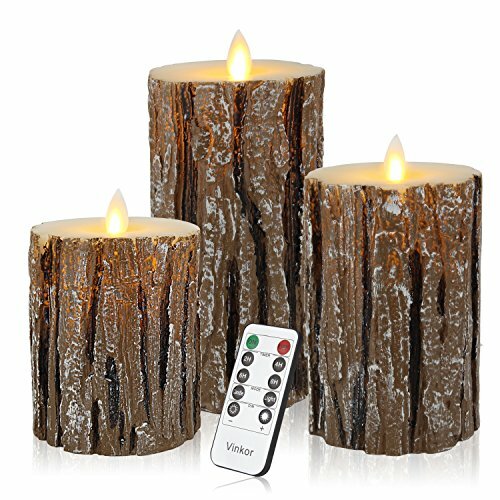 THE PERFECT DECORATING FLAMELESS CANDLES: These incredibly realistic flickering LED candles are a beautiful addition to any dinner table, party, bedside table, Christmas decoration and so much more. The flame stimulation technology makes these wonderful candles sway and flicker so beautifully and convincingly, that you and your guests will be definitely impressed! If you have any questions about this product by Vinkor, contact us by completing and submitting the form below. If you are looking for a specif part number, please include it with your message.